An interesting and fascinating bike ride along the old disused Godley link line, which was used as part of the Woodhead route. At Godley junction these used to be a large set of sidings and a marshalling yard. All of this is long gone, but there is quite a lot of industrial heritage left to see.  The bike ride is pleasant and away from busy roads. To make this a full bike ride, I took in the the canal from Audenshaw via Ashton, to get to the start at Gee Cross. You could just take in the Godley link if you wanted. The map below is just concentrating on the old railway line, but like I did you may wish to use the Peak Forest canal as an way of getting to the link line. I started the route at Apethorn road - left of the map. You can see the route of the Peak Forest canal. 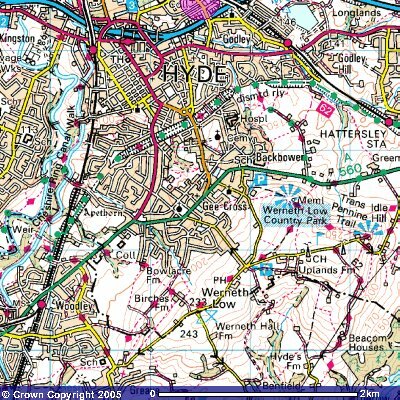 The link line is clearly marked running round the outskirts of Hyde. The line joined the Woodhead route at Godley Junction station (which has long since been taken out of use). Again I started at Lumb Lane, Audenshaw, Greater Manchester, this is close to where I live and gives us good access to the Asthon canal. 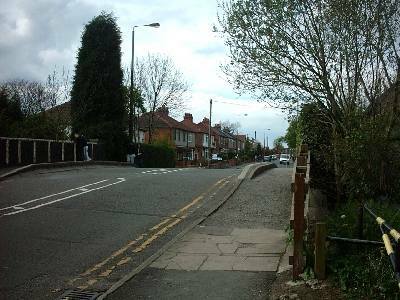 Lumb lane in Audenshaw, this is where we started our journey. The canal runs from left to right. Left down to Manchester (via the City of Manchester Stadium) and right to the Staylbridge, via Ashton. I headed right towards Ashton. The Ashton Canal, taken just outside of Portland Basin in Ashton. The River Tame at Ashton - a new shot of the aquaduct taking the Peak Forest canal over the river Tame. I crossed this aquaduct on this route. A countryside picture??? Maybe not, just to the right is a large factory near Dukinfield. 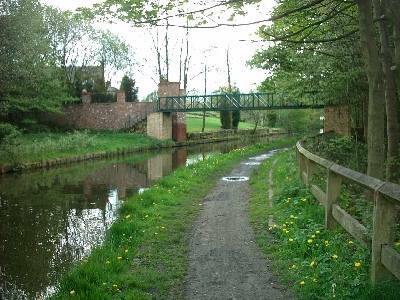 However the peak forest canal does take you deep in to the Tame valley and away from the hustle and bustle of modern life. Remember from our trip last trip on the Peak forest canal, we came across some nesting swans? Anyway here is the proud mum and dad, see the 2 signets on the back of mum. Great to see wildlife - especially considering where I took this picture, just near the centre of Hyde. 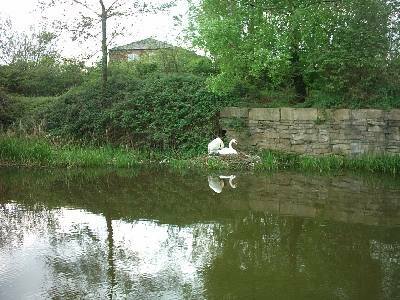 The picture of the nesting swans back in early May. The bridge taking you over to Gee Cross and the start of the Godley link line. This is around the Haughton Dale area. If you want to start this route by road, the road that takes you to this point is Apethorne Lane which is off Stockport road in Woodley (Gee Cross). I crossed the bridge here and rode up Apethorne Lane. Looking up Apethorne Lane. I am stood on the railway bridge which takes the existing line from Woodley to Manchester Piccadilly. The railway off to Woodley, taken from Apethorne Bridge. This is the view of the old Godley link running off the Woodley line. There isnt public access at this point, as it is on BR property. Looking the other way down the Godley link, you can see the path which follows the line of the route. This is where I rode and is the start of the pathway. This was taken on the old railway line looking under Apethorne road. You can see the fence stopping access to the line where it joined the still in use railway to Woodley. One of many original bridges still in place. Im not too sure which road uses it, but it was taken on the pathway near Cheetham Fold Rd in Gee Cross. You can see the tarmaced path on the right and the softer bridle way on the left. This path is in excellent condition, there are also benches along the way to stop off and have a rest. Well thought about. Not much infrastructure remains on this routes, but I came across this original telegraph pole near Stockport Road. I think this is where Dowson Road crosses the route. Note the bridle way has swapped sides. The pathway at Stockport Road (near Hyde) notice the access point here. This takes you up to Stockport road, and then a nice down hill section in to Hyde town centre. Further on there are 2 overbridges which link Mansfield road and Peel street. Eventually the route comes to end at Godley Junction where the line used to join the Woodhead route. This is the end of the cycle / pathway, but there is still a lot to see. This part of the route orginally had a large marshalling yard and sidings. The Godley link was not electrified, so at Godley junction they used to swap from electric traction to diesel. This area was a hive of activity and still today there is quite a lot of industrial heritage still to be seen if you root around. I have used the excellent Woodhead part 1 book, by EM Johnson as a guide. (See the Biblography page for details onthe book). There are some excellent pictures of how this route was in its hey day. The main industrial feature is the site of the old turntable. The pit is still in situ and you can venture down. There is nothing left of the workings. It was taken out of use in the late 1960s. Taken from the other side of the turntable. Taken from inside the turntable. Goldey Junction station. You can ride right up to the end of the line. Here there used to be a large station and marshelling yards. The station closed many years agao, but as you can see a disused footbridge still exsists as well as the paltforms. The old Godley station used to serve the Godley link loop, here is what is left of the platfrom looking back down the loop. The platform is on the right hand side. The link was mainly used for Freight and passenger traffic was very low and was withdrawn many years agao. A close up of the platform edge. Mother nature is taking over! Back near the turntable I found the remains of what I think was an old Siganl box. It is raised up off the ground and today only the brick structure remains. Maybe somebody could shed some more light on it? Part of one of the old centenary supports near Godley junction. The electric lines ran down the link for a short length to allow the electric trains to drop off their load, often this was coal from the Yorkshire pits. Looking at EM Johnsons Woodhead part one book, you can see these supports in their full glory. Sadly this has been reduced to a stump. This was taken from Brook Fold Lane. Above is the Godley link railway. Notice how he line was widened with the cast iron addition to the exsisting brick arch (far). The site of exsisting line where it crosses Mottram road in Godley. This is also the site of Godley station. Which is still in use. This was part of the Woodhead mainline route, now communter trainers trundle past heading to Manchester from Glossop and Hayfield. I hope you have enjoyed this route. Its a great route to take to get away from it all, but also to see some great un touched railway heritage. Out of interest I took Motram road through Hyde back to my home. The road was busy with cars and trucks. This made me wonder why we ever let the Woodhead route go. It would have helped to keep trucks of the road and help provide an alternative rout to Sheffield away from the busy Woodhead and Snake pass road routes. Like the Fallowfield Loop I am glad the Godley link line still exsists for people to enjoy. The pathway is an excelent resource. Take a look if you around the area.